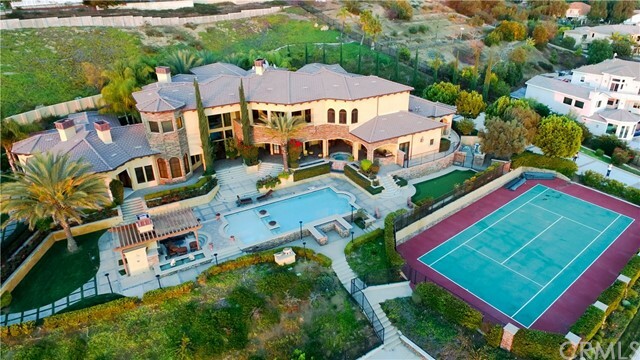 Prominently situated in the prestigious hills of Yorba Linda, you’ll find a Tuscan-inspired masterpiece with sprawling panoramic views set behind custom wrought iron gates on nearly 2 acres. Thoughtfully inspired, this estate was custom built with only the finest of materials and designed to allow striking views from every room all while maintaining the utmost privacy. A massive great room offers stunning views of the rolling hills and city lights as well as a warm and inviting fireplace and entertainment area. The chef’s kitchen features a massive granite island with exquisite cabinetry, built-ins, refrigeration drawers, top-of-the-line appliances, walk-in pantry and formidable crown molding and ceiling treatment. Just off the first landing on the sweeping staircase is a formal and inviting library, completed in decadent woodwork and offering a marble fireplace and custom ceiling treatments. The estate features dual-master suites, her's with large soaking tub, massive walk-in shower, gorgeous walk-in closet and warm fireplace. His suite offers a personal gym area, large walk-in shower, and expansive closet. A home office is located conveniently off the master suites. The expansive resort style grounds offer multiple covered patios and loggias, allowing for exceptional entertaining and relaxing alike. 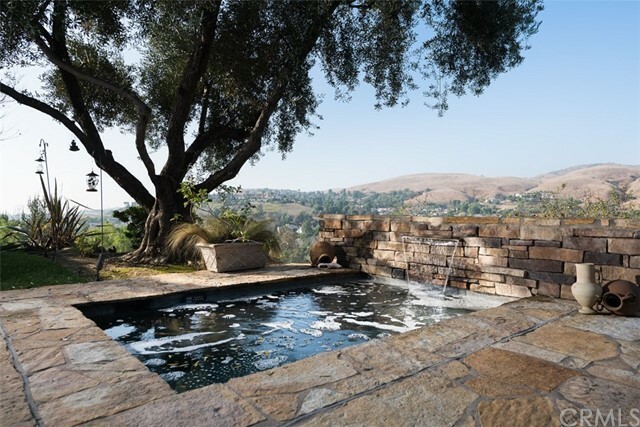 Stunning water features include an infinity pool, spa, and multiple koi-ponds. Rounded out by a 6-car garage, substantial and usable lot and gorgeous mature landscaping. Lot Size Area: 73355.00 Sq. Ft.